We all strive to be the type of friend that gives the unique gift. Unfortunately, if we don’t have a crafty bone in our body, our job becomes harder. Fossils and crystals are those perfect gifts. Formed thousands – if not millions – of years ago, these distinct treasures have just been waiting underground for that ideal moment when they are brought to the surface to be cherished. A fossil is a preservation of a once living thing freezing a moment in time from long, long ago. Impressions of ancient footprints, insects, leaves, shrimp and more can be preserved in the host rock. They can even confirm climate change, as can be seen in the fossilized horn coral found in the Bridger Mountains. The most desirable fossils are found when the background rock is a contrasting color from the fossil. For instance, ancient shrimp are preserved in such detail against their contrasting rock that their antennae and legs give the illusion of being drawn in brown on a cream colored backdrop. Likewise, multi-colored leaves are beautifully impressed on beige sandstone. Other fossils preserve a 3-D stone replica of ancient life forms. Examples include teeth from sharks or mammoths, bones, skulls and horns from dinosaurs. Thrilling to hold, trilobites are one of the oldest marine organisms. Worth taking the time to examine, trilobites’ remarkable compound eyes and three-segmented body make for mesmerizing fossils. When choosing a fossil, research the store or seller so you can be confident in their reputation and expertise. As with anything else, fossils can be faked. Look for repairs or enhancements. Is the collection area and age of the fossil included? Know what you are buying by asking questions and developing a relationship with your local rock and fossil store. Some minerals form into distinct symmetrical shapes called crystals. Quartz crystals, six-sided “rods” ending in pyramid points, can be clear, purple, black or yellow. The most prized quartz crystals are transparent with inclusions that reflect brilliantly colored rainbows. Some rare quartz can even have red, black or golden “needles” inside formed by the minerals tourmaline or rutile. Calcite crystals form into dogtoothshaped points or rhombohedrum shapes (a slightly squished box that is tilted to one side). Barite, pyrite and galena form perfect square crystals, while cavansite and wavellite create rare pinwheel-shaped crystal formations. A truly one-of-a-kind natural work of art, crystals can be beautifully set or wrapped in eye-catching jewelry. Single pieces with multiple crystal shapes are a visual delight. When choosing a specimen, inquire if all sides are natural or if some (or all) have been polished and determine if anything has been heat-treated, dyed or radiated to intensify colors. Fossils and Crystals are a limited resource. Collection sites can become exhausted, flooded or closed. 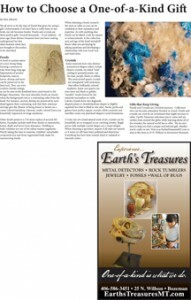 Fossils and crystals can even be an investment that might increase in value. Earth’s Treasures welcomes you to come and see rarities from around the globe while learning about all of the wonders the natural world has to offer. We are also here to help you find a unique and beloved gift, whether you’re crafty or not. Visit us at EarthsTreasuresMT.com or stop in the store at 25 N. Willson in downtown Bozeman.